I don't know, who am I? When she's not writing, she trains dogs in tracking, sheep herding and obedience work and grows all her fruits and vegetables on country acreage. She managed to raise two sons who have turned out to be pretty cool people. Mary won the Compton Crook award for Best First Novel, Asimov's Readers Award and has been a Hugo Awards finalist. Mary has been on the short list for a lot of awards, but she doesn't keep track. She publishes in mystery as Mary Freeman, teaches writing for Long Ridge Writers Group and at writers workshops. I knew we were in for another treat at WOW ! as soon as we connected with Mary Rosenblum. She's a seasoned pro that is happy to share her knowledge, wit and feelings. Get ready, because this lady is about much more than writing, as you can tell from her introduction. However, it is her openness to what's going on around her, as she experiences a wide variety of life's events, that impacts her writing. Word is, if you stick with Mary Rosenblum there's no telling where you'll end up, perhaps, even in outer space. However, we can promise you this, if you want to become a better writer, this is the woman you want to talk to; if you want some good reading, you'll be happy with Mary Rosenblum or Mary Freeman. We've had a great time visiting, emailing and chatting on the telephone with Mary. We can't share all the good times and vast knowledge; but we'll do our best by you. We met Mary and Louise Marley and we were delighted to find they are as passionate about learning what readers have to say, as we are. Mary has a great deal of respect for booklovers and works hard personally, and with her students, to write well, so readers won't be disappointed. WOW: "How did all of this start? When did you know you wanted to become a writer?" MARY: "I always wanted to be a writer. However, I got told by a couple of well meaning English teachers in middle and high school that writers were essentially Born With Talent and I should aspire to something else." MARY: "I wish I had those teachers' addresses. I could ship them a VERY large box of books, anthologies, and magazines, COD." We all laughed as we visualized the expressions on the faces of these teachers with crates in front of them and the UPS engine purring in the background. MARY: "Never listen to well meaning people who tell you can't do what you want to do with your life. "So, when did I decide this was a reality? Well, I wrote a couple of pieces for the science journals when I worked in research. That was fun. I was good at it. So I queried a magazine about an article on home dairying (I had goats) and landed a monthly column. This was even more fun." We had to grin, feeling the fun and energy build as Mary moved into a writer's life. 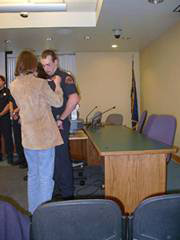 This is a momentous occasion for Mary and her son, Jake, when she pins his badge on him, now a full time firefighter. "I had never stopped telling myself and my young sons stories, and rewriting those books I read-that just didn't end the way I wanted 'em to. So I decided, hey, why not? I sent off a Science Fiction short story to Analog Magazine...which got me YELLED at by the editor, Stan Schmidt (the story was good, the ending was dreadful!). "I didn't realize that a personal response from a major editor was actually praise, and I was a bit taken aback. But I had submitted the story to the Clarion West Writers Workshop and it got me in." Mary breaks into a big smile. "So, I attended in 1988 and sold my first story there, to Gardner Dozois of Asimov's Magazine." She leans forward, "Mr. Dozois terrified me when I first met him. We have since become close friends and he has published many of my stories. After Clarion, I wrote a lot, got a lot rejected, and began to sell...one here, another there. The pace picked up, I never looked back, and here I am." And, we are all so glad she did. WOW: "We know one of the loves of your life is teaching. Tell us, how did you come to be associated with Long Ridge Writers Group?" MARY: "I attended a signing in White Salmon, Washington, to promote one of my mysteries. The woman who organized the event thought I would be a good instructor (WOW murmurs in agreement), and she connected me with Long Ridge. I decided to try it, fell in love with the course and the people at the school, and have been working with students ever since." WOW: "And, how long has that been?" WOW: "How have your activities as an instructor influenced your writing career?" MARY: "They've really helped me. What I do with the student manuscript is to help them tell the story they want to tell, but in a better way, or I help them make an article work for readers. In terms of fiction, it has truly expanded my craft. You can tell a good story in an infinity of ways, and the more I work with diverse writers, the more flexible I become as a writer." WOW: "From your vantage point, why would you recommend writers workshops for aspiring writers?" MARY: "What workshops or courses do for you is to shortcut the process of learning and gives you confidence. Many talented writers never publish, because they give up. If you have skilled readers who tell you 'no, this is good, keep trying', you're more likely to do that." We have to give a nod to that. "Writing provides zero feedback. You write, you send out, you get a preprinted rejection slip. Was that piece awful? Was it very good, but the editor has one just like it in inventory? You don't know. Working with an instructor or an advanced workshop helps you learn craft very quickly, rather than through a longer, slow process of trial and error." WOW: "You see so much effort put forth by aspiring writers, if you could only give one piece of advice to a writer, what would you say?" MARY: "Never give up! If it matters to you, keep doing it. Believe in yourself." WOW: "After all of your hard work, do you recall your thoughts after being referred to as 'a talented new writer?" MARY: "Oh, that!" She breaks into one of her big smiles. "I had been called a 'talented new writer' by several reviewers and it just went right past me until I was doing laundry in the basement one day. "I didn't get a lot of support in what I did growing up, and success in my family was measured in terms of making money or receiving international awards. Ha! But it finally struck me, that yes, I WAS talented. "The most difficult thing for many of us to do is to believe in ourselves. You have to work at it. And let me tell you, the day that someone comes up to you at a signing or a reading and tells you how this story or that one really affected them, changed their lives...you will realize that no check will ever matter that much, no matter how big it is." We embraced her statement and realized this is the key to keeping our hearts in our writing. Moreover, the reader benefits from the author who truly believes and feels this way. And, speaking of readers, we had to ask about writers being readers, too. WOW: "How important is reading to a writer?" MARY: "Critical! You need to stretch, grow as a writer. Read things that you wouldn't ordinarily read. Read things that are outside your 'universe'. The more you broaden your mind, think about things, and see other viewpoints; the more you will bring to your writing, no matter what you do. I analyze everything I read...what did this author do that I love? Where did he/she not quite pull it off? I am always learning." WOW: "That's great! You know, Mary, we've all heard someone say they have a great book in them, they're just too busy to write it. However, you've said your busy life is not accidental. Obviously, you feel being busy can help writers. How so?" MARY: "Staring at the screen doesn't get anything done. I find that some of my most creative time is while I'm doing manual tasks that don't require intellectual engagement...folding laundry, weeding the garden. "And I am always hungry for writing time, so when I get it, I throw myself into those hours." WOW: "But, that has to be difficult from time to time, what has been your biggest motivation to keep writing?" MARY: "There is nothing on this planet I would rather do. Don't get me wrong...it can be very hard on your ego, and I have tried to quit writing more than once. Can't do it. And I have worked VERY hard, by the way, and am quite poor, relative to the national income average, but it's something I've been willing to accept, because how many people get to do what they want to do for a day job?" Seeing that great smile made it a bit difficult to ask the next question, but we did it anyway. WOW: "How do you handle...rejection letters?" MARY: "Weep. Tear my hair. List all the genetic failures of the editor. Then I send the story off somewhere else and go write something that'll knock that SOB's socks off...only, I'm going to send it to someone else first!" She grins to show there's no contract put out on the editor, but there is no denying her focus and determination. Yes, I still get rejection slips. Everyone does, no matter how much you sell. Not every editor wants THIS story. Yes, I generally sell them somewhere else." WOW: "That makes us think of the "it isn't a fair business" that we hear/say from time to time. What would you file under the heading: 'It isn't fair!'" MARY: "Oh, gosh, my real peeve is that quality does not equal the monetary success thing. Let's face it, if you write what you want to write, your success is based on luck. If a LOT of the general public love it, you have a Harry Potter and can live happily ever after...at least financially. "If you write something that the critics love, is powerful, but goes over the heads or right past those 100,000 readers...but you know what? Publishing is a business and that's how it works. Fair? No. You want fair? Go do something else." WOW: "You've give anyone with shaky dedication to her writing a lot to think about. We're going to switch subjects on you now and quote you. You've said that you'd love to have an ebook out. So, of course, our first question is: Can we sell it through our bookstore?" Then, we give our best smiles beneath shiny, big eyes. MARY: "Of course you can sell it through your bookstore." She returns our smile. WOW: "Great! Now, our second question is why did you say you'd love to have an ebook out?" MARY, continuing to smile: "Well, because I pay my rent from my sales, I do look to the big NY publishers first for my sales. You tend to make more money there, and advances are nice when it comes time to pay that HUGE property tax bill. BUT, I think publishing is at the beginning of a transition and our expansion of media is going to play a role in that. We have a generation that has grown up reading on screen. We have the ipod invasion. I think print books are NOT on the way out, but I do see a proliferation of forms and marketing. How it all will settle out and how soon, I don't know. But I'd like to be part of the change rather than stand on the sidelines and watch it all happen. I want to do some of my huge inventory of previously published stories as podcasts, too. That would be way cool." We sit even taller, lean forward and all smile while heads are a-bobbin'. Meanwhile, that question leads into this month's theme, "No One is Born Published." Our theme, by the way, is Mary's brainchild and we thanked her. "It's true, no one is born published. Remember how I said the teacher told me you had to be Born Talented? You may be born with a great ability to make up a story, but you know what? If you don't learn the craft, those stories aren't going to be accessible to others. Good writing is learning how to do telepathy with ink marks on paper or phosphors on a screen. You have to translate that three dimensional reality to the mind of your reader...or listener." We all connect again, each visualizing...hearing...her podcast! "Too many novice writers think they WERE Born Talented, and if they write down one story, it should sell and sell very well. They don't realize how much WORK it takes to transform that internal vision into a sharable vision. I wrote and wrote and wrote and wrote...every spare second, every five minutes. "I was a single mom with two young sons and believe me, those minutes often came very late. I wrote stories that never worked, I wrote stories that didn't sell, I wrote more stories and some of those worked. A few even sold. I looked at what I wrote, I looked at what really good writers wrote, I tried and tried and tried to see what the difference was and make it happen in my work. I said 'no' to a lot of things-to write. It is not handed to you as a gift, folks. Publishing...you work for it." It's obvious that Mary's knowledge, experience and wit are melded with honesty and a desire to help others-see their product of blood, sweat and tears in print. WOW: "Drawing on your experience as an author and instructor, what makes the difference between writers who do well and publish and those who don't?" MARY: "All of the above." Her look became serious and then an impish smile began to spread across her face. "That and an incredible stubborn streak that won't let you quit even when it makes perfect sense to do so!" Our fellow feeling and past experiences pool and lead to laughter. (We think we can hear a snicker or two from you, our readers.) But, on to the task at hand. WOW: "Back to the print world-NY and smaller publishers, self-publishing, e-publishing-what is a newcomer to think? Are there advantages to the expanding publishing world or is a difficult road only becoming more complicated?" MARY: "Publishing is becoming easier and more difficult both. Anyone can publish a book. Doesn't matter how good you are. We have a host of 'quantity publishers' who will publish any book, if it is reasonably readable...this floods the market with this multitude of...I hate to say it...mediocre books. So readers can't rely on the brand to tell them that the book is good. "The challenge is how to let enough readers know this is a good read, so you can make a reasonable return from that book. But the cost of books is rising, bookstore space is more expensive, and they are corporations. The bottom line matters. So they are reducing the number of books they publish, focusing on the established 'big names' and the occasional new writer they try to jumpstart into a block buster." WOW, grimacing: "Would it help an aspiring author to have a website and/or a blog before getting published, or should she wait until she is published?" MARY: "I'd start one now. The more people who know your name, the more people who will buy your books." She beams at us as we light up. "The best PR in the world is internet propagation. Nobody knows how to MAKE it happen, but IF it happens, it can sell thousands of books for you." WOW: "Speaking of selling books, tell us about your latest book, when and where we can buy it, where can we see you next..."
MARY: "My next book out, HORIZONS, will be released from Tor Books the first week in November. It's already available for preorder from Amazon.com. "I got a really nice review from Publishers Weekly and to be honest, I think this is the strongest novel I've done to date. It is based on real science about long-term residence in orbit, and by the way-it's got a strong plot and character I like a lot. Tor put a great cover on it. "In January, my first novel, THE DRYLANDS will be re-released from Fairwood Press, along with the three novelettes that are prequels to the novel and first appeared in Asimov's Magazine. The compendium, which includes a forward by me, will be titled WATER RITES. It will be available in January. "I've revised the novel and novelettes, but the process scared me. I did a lot research on global warming back then, and was shocked that nobody much was paying attention to all the information in the public domain. Now, fourteen years later, what scares me is that all the predictions being made back in 1992 are coming true NOW. Not forty years later, as most of the researchers suggested. Heads up, folks. It's time to take this seriously! "As to where I'll be when, check my website www.maryrosenblum.com. I do try to keep my schedules up to date, even if I am a lousy blogger. Although, you can see some cute pictures of my spring lambs there." She gives me a nod because she knows I love lambs. "And when HORIZONS and WATER RITES hit the shelves, I'll be starting a 'reader talk' blog for each of the books, and those I WILL keep up on a daily basis. They'll be a place for readers to comment, ask questions, or gripe about the books. Yeah, I'll publish the gripes, too! Those links will be available on my website and I'll try to make them obvious when you drop in there." Though it saddens us to bring this great session to a close, we know that even in cyberspace there are limits. WOW: "Mary, what would you say to aspiring writers that no one should forget-no matter how many books they've published? MARY: " You weren't born this way. People gave you a hand up, so do likewise to the ones coming along behind you." And we are so thrilled that she feels that way and we know you're glad, too. Mary first published in Asimov's Magazine Asimov's Magazine in 1990 with 'For A Price', one of her Clarion West stories. (She attended that boot camp for writers in 1988). Since that first publication, she has published more than 60 short stories in SF, mystery, and mainstream fiction, as well as eight novels. Her newest novel, HORIZONS, will be out in November from Tor Books, and WATER RITES a compendium of the novel DRYLANDS as well as three novelettes that first appeared in Asimov's will be released from Fairwood Press in January 2007. Her SF stories have been published in Asimov's, The Magazine of Fantasy and Science Fiction, SciFiction, and Analog among others.